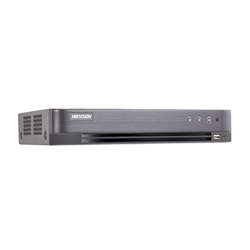 This DVR from Hikvision features a range of self-adaptive signal inputs and offers support for up to 4 cameras. It can house a single hard drive with up to a 6 TB capacity. Using H.265+ video compression the DVR can store more footage on the drive without compromising image quality and reducing storage costs. As a Tribrid DVR, the DS-7204HQI-K1 gives you the flexibility to use up to three different types of camera including TVI, analog and IP which makes it a great choice for retrofitting existing systems that use cameras with coax cable connections. While it’s always best to use Hikvision cameras with a Hikvision NVR, the DS-7204HQI-K1 is ONVIF compliant, meaning it can be used with cameras from other brands that are also ONVIF conformant. Note: Not all functionality may be available on cameras from other brands if paired.